Description: Choose from a wide range of firebox styles and sizes suited to match any project or go with a Dimplex electric fireplace insert - a fast, clean way to reclaim your old masonry fireplace. Refined through 25 years of innovation, the patented Dimplex® flame effect is the most authentic in the industry. While looking every bit as good as masonry fireplaces, Dimplex® electric fireplaces provide unmatched flexibility and ease of installation with no venting or gas lines required. Direct-wire electric fireboxes offer several design options to choose from including cabinet surrounds, doors and trim kits. Enjoy the ambiance of patented Dimplex® flame technology by simply plugging in to any standard household outlet. Available in a variety of sizes, choose from traditional logs with inner-glow technology or tumbled glass and acrylic ice ember beds for a more contemporary feel. Endless opportunities. Perfect comfort. Dimplex® linear electric fireplaces offer an innovative way to add style to a room. These sleek, space-saving designs solve any installation limitations as they do not take up any valuable floor space. They can be installed almost anywhere – simply plug into a standard household outlet and enjoy the warmth and romance of a fire. An ideal way to create a compelling feature in any room and a smart, practical and efficient zone heating solution, designed to warm up to 400 square feet. 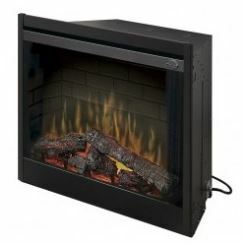 Dimplex® electric fireplace inserts are a fast, clean and safe way to enjoy your old masonry fireplace again. Incredibly realistic log sets are combined with powerful fan-forced heat to provide you with ambiance and comfort. Installation is quick and easy, leaving you more time to enjoy the warmth and glow of your new fireplace.